They’re quick and easy, sweet and salty, chocolatey and delicious. They literally have the most simple ingredient list and are perfect for everything from gifting, to serving at a party… to of course, sneaking away to secretly nosh on yourself…shhh, I will not tell. Traditionally Crescent Cookies are made with almonds, but I was really feeling the cashews with these cookies. 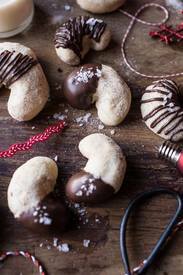 I wanted to keep close to tradition, but yet switch it up a bit, and a cashew crescent cookie that takes a little dip in some chocolate seemed kind of perfect to me.